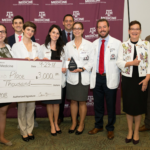 A five-member team of Paul L. Foster School of Medicine students finished in second place out of seven Texas medical schools at the inaugural Shift 2018 – Texas Health Challenges Case Competition at Texas A&M College of Medicine. The event, held Sept. 22-23, aimed to develop innovative solutions to improve health care delivery in rural Texas. 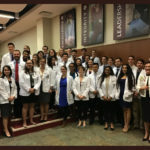 The PLFSOM students’ solution proposed a network of community health care centers that worked with local high schools and churches to connect small-town hospitals to a broader network of Texas medical schools. The plan incorporated telemedicine and rotating specialty services. 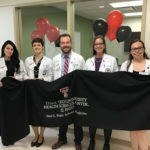 Members of the TTUHSC El Paso team included MS4s Brandy Mills and Alex Palmer, MS3s Brittany Harper and Winters, and MS2 Roxann Lerma. 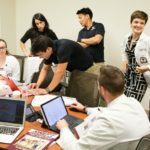 The two-round competition required the team to request the correct labs, diagnose, and formulate a treatment plan for a theoretical patient that lived in a rural Texas town. In the second round, the team had to formulate a plan to meet the health needs, not only of that patient and individuals like them in their area, but also a plan that was applicable to other rural counties in Texas. The competition was grueling, with the team working 30 hours straight as they fleshed out an innovative way to improve rural health care. The team presented to a panel of judges that included the former Surgeon General of the Air Force, a state representative in the Texas Legislature, the President of the Texas Medical Association, the CEO of a hospital network in Houston, and a physician who works in a small town in rural Texas. In all, 35 of the roughly 7,000 medical students in the state participated in the competition.